The AIR Traffic Display is the redesigned traffic data display system from AIR Avionics. It offers robust hardware that is perfectly legible even in bright light and many advanced features that help pilots with situational awareness. It is compatible with many collision warning systems, e.g with TRX devices, FLARM® or PowerFLARM®. AIR Avionics has developed the AIR Traffic Display from scratch. It will help to better assist pilots in collision avoidance. The new AIR Traffic Display offers even more traffic overview, easier operation and better readability than their earlier Butterfly displays. In addition to FLARM®, it can also display ADS-B and transponder traffic. Software updates via microSD card. The AIR Traffic Display is compatible with all FLARM® and GARMIN® TIS® compatible collision warning systems and traffic receivers. 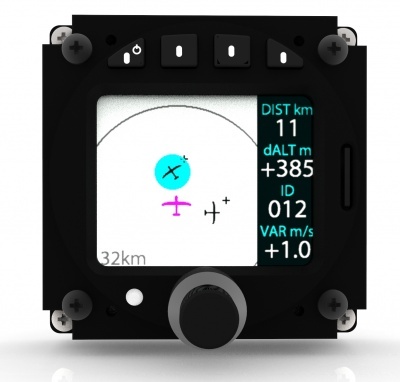 It works directly with TRX devices, FLARM® devices, PowerFLARM® devices, LX-FLARM and devices from many other manufacturers without any configuration effort. The delivery includes a standard FLARM® cable (RJ45). AIR Traffic Display can be installed as a direct replacement of a butterfly display or other FLARM displays in a 57mm round cutout. It is covered by the Minor Change Approval for TRX devices or FLARM® systems and may therefore be installed in a wide range of aircraft.